Archive for the ‘Lanark Ontario’ Category. 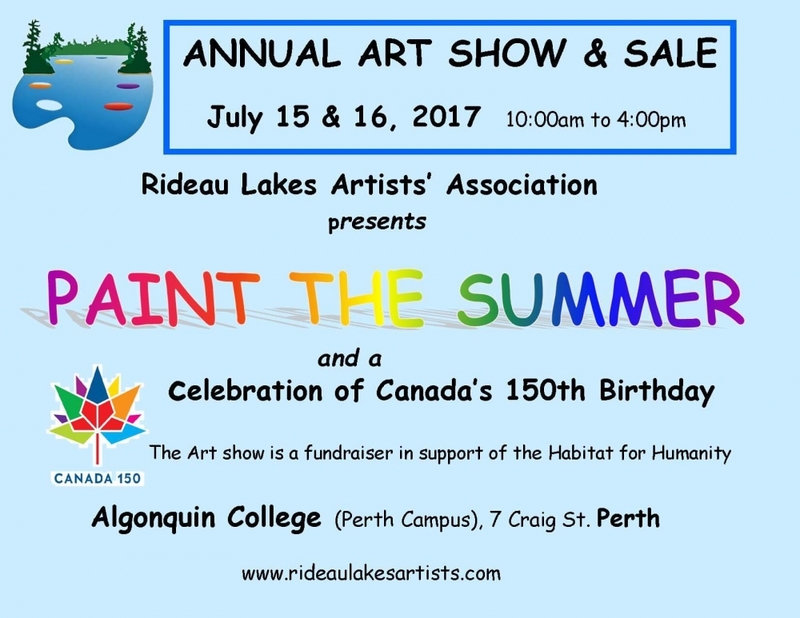 The Rideau Lakes Artists’ Association is switching things up this summer. They are introducing a new venue to help celebrate Canada’s 150th Anniversary by introducing a new summer show, PAINT THE SUMMER, at Algonquin College in Perth, 7 Craig Street. This facility is perfect for viewing their wonderful original paintings in oil, acrylic, watercolour and batik for which our Association is well known, this year honouring this great country of ours. They will also offer other art forms from these talented artists for your enjoyment. You will still be able to meet with the artists and discuss their ideas and inspirations while also getting to know the dynamics of this successful art association. They will be featuring a painting competition to celebrate Canada where the public will be able to pick the People’s Choice. The show will be open Saturday, July 15th and Sunday, July 16th, 2017 from 10 am to 4 pm. 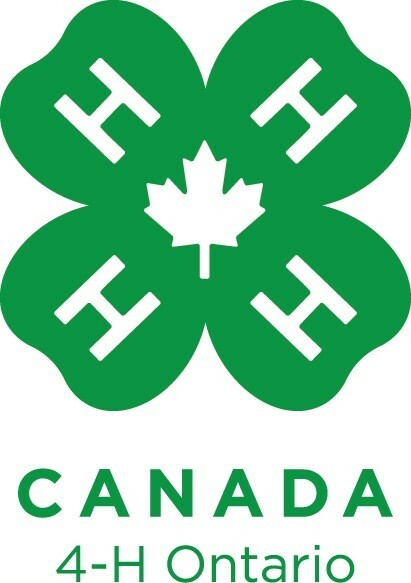 This year the show will be supporting Habitat for Humanity as their charity. There is plenty of free parking and admission is free. For more information be sure to look for their brochures in local businesses, view their website at www.rideaulakesartists.com or visit their Facebook Page. All concerts are FREE to the public and are held in historic Stewart Park just behind the Perth Town Hall. Bring along a lawn chair or simply enjoy a leisurely stroll through the park. 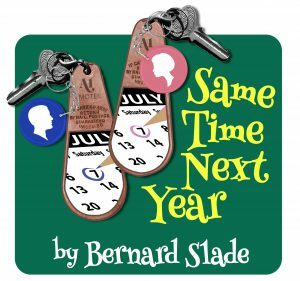 The most successful Canadian comedy ever staged on Broadway. 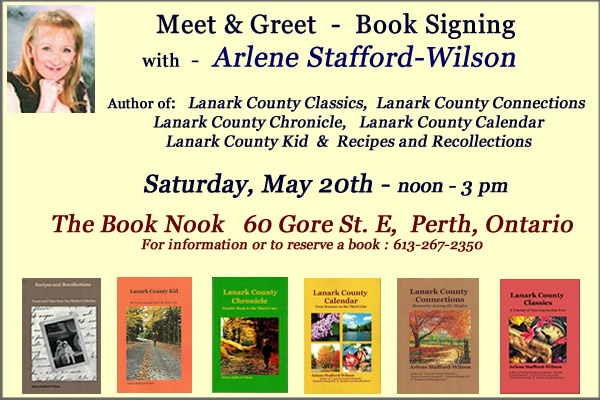 Meet & Greet & Book Signing with Arlene Stafford-Wilson, author of – Lanark County Classics, Lanark County Connections, Lanark County Chronicle, Lanark County Kid, Lanark County Calendar and Recipes and Recollections. Stories set in: Perth, Almonte, Carleton Place, Rideau Ferry, Port Elmsley, Smiths Falls, Lanark, Balderson, Pakenham, Middleville, Glen Tay, DeWitt’s Corners, Clyde Forks, Maberly,and Fallbrook. Experience cultural and culinary tales as you meander through some of downtown Perth’s best restaurants and bakeries, tasting and savouring their food. 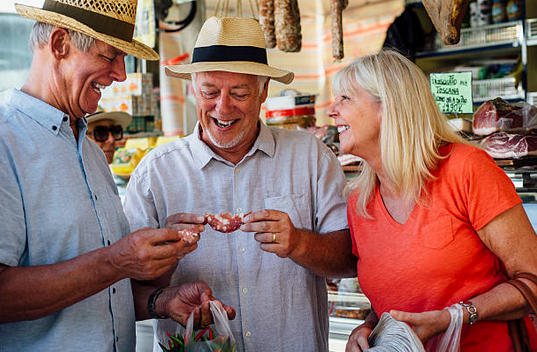 The tour includes a friendly tour guide, six to seven food tastings (enough for lunch for most people), a bottle of water, and many culinary, cultural and historical anecdotes. Leave from Matheson House Museum, 11 Gore St E. For more information visit perth.ca and click on Food and Drink. This event occurs weekly beginning Saturday, May 13, 2017 until Saturday, June 24, 2017 on Saturday. The summer-like weather is finally upon us after a long-delayed spring, and what better way to celebrate than with a summer fashion show. Fashions with Flare is a fundraising event scheduled for Monday June 15th to support ongoing operation costs for the Lanark County Community Justice Program. The event will be held at the Perth Civitan Club with doors opening at 6:00 p.m. for a selection of treats and snacks as well as the opportunity to bid on wonderful items in the silent auction. The fashion show will start promptly at 7:00 p.m., featuring clothes from Fall River Fashions, Lavender and Lace, Giant Tiger, Fashion Envy and Jewels. Our volunteers are busily at work planning this 3rd annual event, which will bring a few surprises. We are pleased to welcome Hugh Colton as our emcee for Fashions with Flare and the first fifty ladies through the door will receive a complimentary flower. In addition to the silent auction, there will be door prizes and a raffle, as well as the chance to take home one of our unique table centrepieces. There will be a cash bar as well as tea and coffee available throughout the evening. Lanark County Community Justice Program (LCCJP) was formed in 1998 and provides service throughout Lanark County and the Town of Smiths Falls. LCCJP receives court diversion referrals from the police services and the Crown Attorney’s office for both youth and adults on a pre-charge or post-charge basis. Our trained volunteer facilitators bring together everyone involved in an incident in a community forum with the goal of healing the harm that has been done in our communty. Accused persons gain an understanding of the harm they created. Complainants come to understand the circumstances that led to the crime being committed. Both the accused and the complainants have a voice in creating an agreement to bring a resolution to the incident. Community support is a vital part of our onging operations and we recognize the Perth Civitan, the participating clothing stores as well as the numerous businesses who are donating silent auction and door prize items for this fashion show. LCCJP is also proud to be a United Way Lanark County partner and appreciates the financial support we receive from many service clubs and community groups. For more information about the Lanark County Community Justice Program, please visit our website at http://www.commjustice.org/ or contact our Executive Director, Beth Peterkin, at 613-264-1558 or beth@commjustice.org.